Walking over to The Globe Gallery, Blandford Square last week to attend the Magnificent Distance critical discussion day, I took a route through the west part of the city that is out of my normal home-city centre / home-university groove. This is the part of town just beyond the main shopping area and Gallowgate towards St James’ football stadium. It’s an area that I used to be very familiar with when I lived in Summerhill (just off Westgate Road and around the corner from Globe). It’s a part of the city that has changed enormously in the now 20 years that I have lived in Newcastle – including the construction of the ‘boulevard’ (a dual carriageway that I remember as being much opposed by local residents when I lived in Summerhill), closure of the Newcastle Brown brewery, extension of the football stadium and the growth of the new City Gate developments. The area of the old brewery now has a high profile as the site for the new Science Central development, flagged as the largest city-centre development opportunity for over a decade. On my way I passed this memorial to Bobby Robson (former Manager of Newcastle and England football teams, and consequently a major local hero for the City), installed in 2011 (I subsequently find out), but which I hadn’t seen, or perhaps registered, before. It still looks very new and cared for. 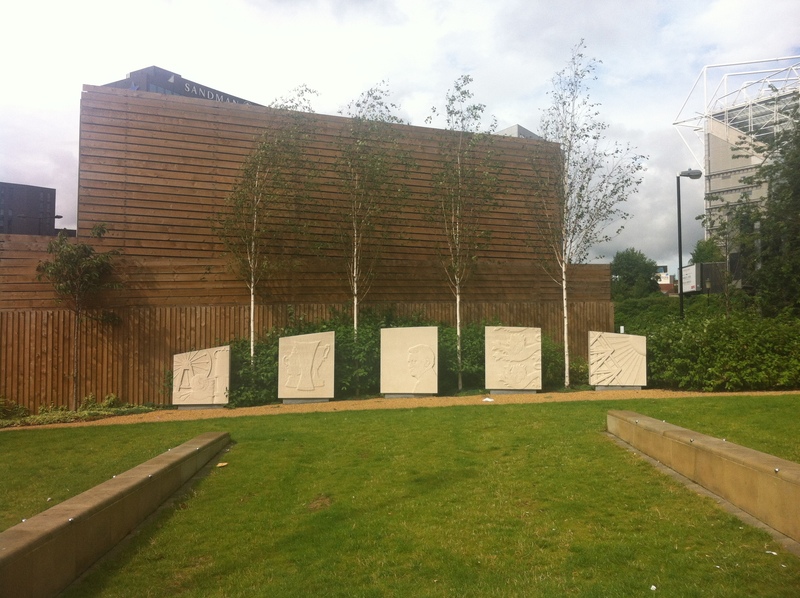 The location/work is officially known as the Sir Bobby Robson Memorial Garden, commissioned by Newcastle City Council and NE1 (Newcastle’s business improvement district company), and designed and sculpted by artist Graeme Mitcheson. It’s also been in the news, both press and media, as having been subject in March 2012 to some obscene graffiti, allegedly by rival Norwich football fans. But this was quickly cleaned off by Newcastle City Council’s rapid response team. A video interview with the cleaning team is posted on the Sky Tyne and Wear website. With football and also the Olympics on my mind I later passed this ‘mystery’ artwork (? 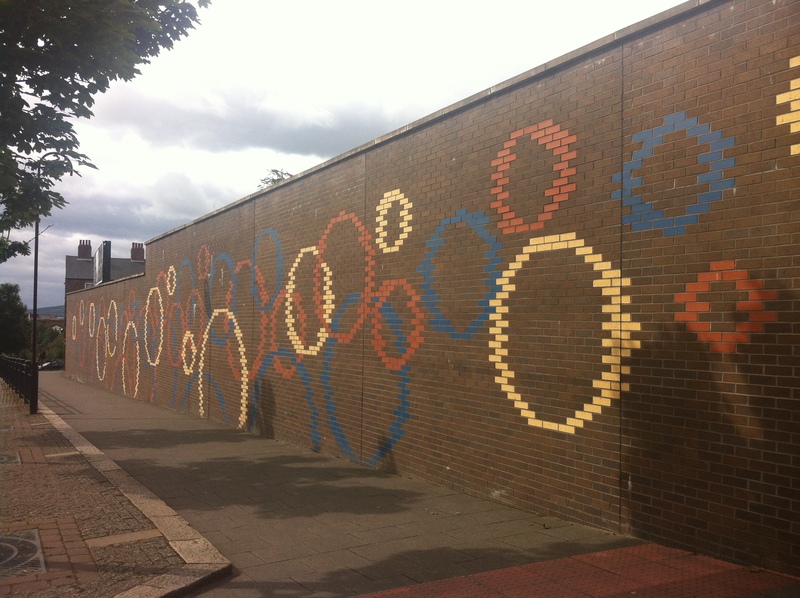 )/wall piece (the repeated and interlinking circles certainly making me think ‘footballs’ and ‘Olympic symbols’). I haven’t found this feature listed anywhere so far as a piece of ‘public art’. It’s pretty bland as a design but does certainly make this quite long stretch of dull wall more visually interesting as I walk along it. (2012). 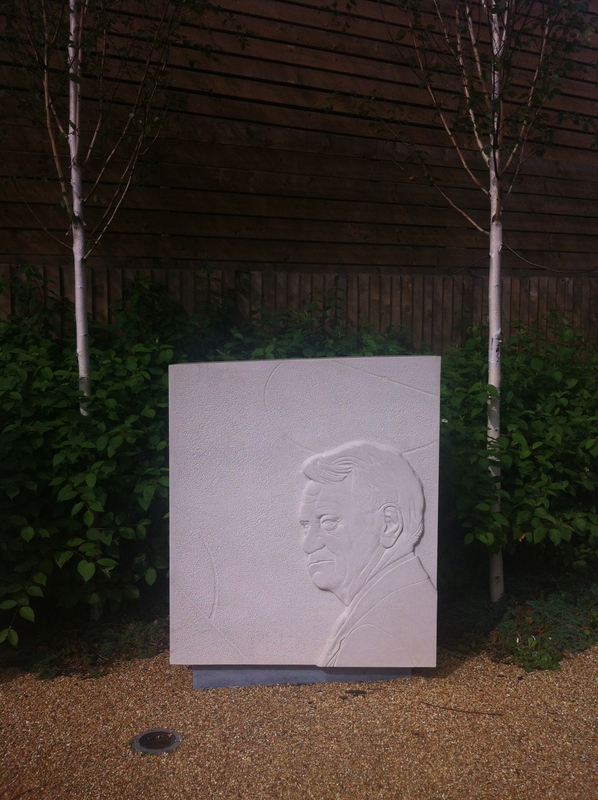 ‘Obscene Graffiti Cleaned Off Sir Bobby Robson Memorial in Newcastle’, Sky Tyne and Wear. [Online] Available at http://tyneandwear.sky.com/news/video/15413 [Accessed 29 August 2012). A Sunday walk with my partner from home down to the Baltic Centre for Contemporary Art turns into a bit of a public art tour, past some already familiar but also some newly noticed/unseen works, which begin perhaps to stretch the working parameters of my data collection work on the NewcastleGateshead ‘public art collection’. In labelling these images for this post, I’m following a standard, title, artist, commissioner, date, mode. I’m aware that this is a structure/format that pervades my own experience of (including my initial identification of) these as ‘artworks’. The initial (to me) ‘anonymity’ of much of the ‘street art’ style work in the Ouseburn is just an illusion (my ignorance of this genre) – it takes only a few minutes of googling to identify the artists and that this is all ‘commissioned’ work. Over the last couple of days I’ve come across several mentions of the launch of a new Big Art Mob website and app. Art Public, the creatives/developers behind the project also worked with Channel 4 on the original The Big Art Project back in 2006 – a reality TV series / public art experiment that encouraged local people in seven communities across the UK to actively engage in the public art commissioning process. Art Public were also one of the teams selected as part of the (Arts Council England/LOCOG funded) 2012 Artists Taking the Lead programme (see Bus-Tops, LED screen artworks for bus stops across London). I already have a few similar ‘public art/street art’ mapping and sharing apps on my phone already – Art Mapped, Urban Art Guide, and Banksy – so it will be interesting to see how the Big Art Mob version will differ from or improve on these, how its users will define ‘public art’, and whether it succeeds in its collective, cultural and commercial aims. Sources: Alfie Dennen, Art Public, quoted in (1) Rosie Spinks blogpost ‘A Very Public Guide to the World’s Public Art’ and (2) Mike Butcher’s Tech Crunch post ‘Big Art Mob Plans to Turn Urban Street Art Into Cash Via Tourist Maps and API’.